Experience the deep-rooted holiday traditions of Europe at its most festive time of year. From the iconic canals of Amsterdam to Switzerland’s glittery cities, Lucerne and Zurich, get caught up in the magic of the holidays with visits to some of the world’s most timeless Christmas Markets. Warm up with a mug of steamy glühwein while at the Cologne Christmas Market located in front of its UNESCO-designated Gothic cathedral. Let the "Capital of Noël," Strasbourg, the oldest and largest Christmas Market in France, captivate you the way it has for so many others for centuries. Meander through Heidelberg’s majestic Christmas Market nestled idyllically amongst the historic squares of the Old Town. And while in Gengenbach, marvel at the world’s largest Advent calendar, where every evening at 6:00 PM, the brightly lit windows of the neo-classical town hall open and behind each one is a picture by a famous artist, such as Andy Warhol. 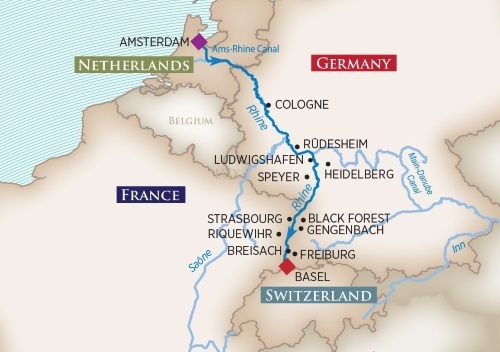 Cherish all the glory of the season in grand European style as you cruise along the Rhine. Christmas Markets Notice: Most Christmas Markets open during the last week of November and remain open until approximately Dec. 22. Check with each country’s tourist office for more information.